Some books are worth reading more than once. Kim Stanley Robinson’s Red Mars falls into this category. Like Dune and other great science fiction epics, the book succeeds on a variety of levels, including technology, environment, and characterization. I don’t agree with everything the author says in the book, but I still believe strongly that this book is well worth reading. From a technological level, Robinson populates the book with massive, vehicles and tools that NASA and Russia could only dream about in the best of times. The “First Hundred” astronaut-colonists are sent to Mars aboard a massive rotating spacecraft made of Space Shuttle External Tank segments, and the toys only get better from there. Some come from a chaotic Earth, some are home-grown: massive dirigibles; genetically engineered microorganisms for terraforming the planet; lightweight “tenting” material capable of providing domes to cover entire cities; stealthy rovers; space elevators; life-extension treatments; and on and on. The tale covers a large tapestry of places, technological marvels, and years. As civilization is established on Mars, the tools of survival gradually become more sophisticated as well, and these tools eventually create many of the conflicts that propel the characters across the surface of Mars. Robinson populates his book with many such “sense of wonder” descriptions of the Martian landscape to draw in the reader and to give the reader an appreciation for the natural environment. And yet at the same time, he also puts a great deal of work into describing the transformed Mars and the unique environments and societies that are built there (especially in the sequels, Green Mars and Blue Mars). You find yourself wanting to visit these places! An effective device that Robinson uses throughout the narrative is to shift the narrative’s third-person limited point of view among the main characters. This allows the reader to see Mars, its society, and its people through very different perspectives, from the hard-headed pragmatism of Nadia to the brooding sadness of Ann Clayborne to the happy-go-lucky enthusiasm of John Boone, the first man on Mars. Each of these perspectives is distinctive, believable, and usually likeable and simultaneously flawed. It is with Robinson’s political vision that I must part company. 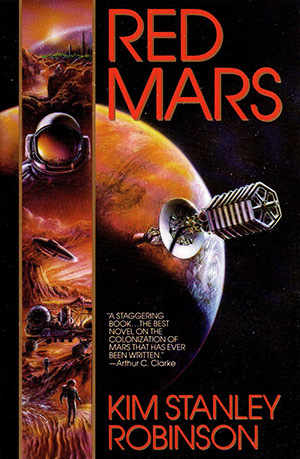 In an interview, he stated that his goal with the Mars trilogy was to write “utopian fiction.” Given Mr. Robinson’s politics, the only moral choices the reader is offered in Red Mars are competing brands of environmentalist liberalism: the “Reds” prefer to leave Mars alone, in its pristine mineral state, while the “Greens” want to transform the planet into an Earthlike world through terraforming. Conservatism (i.e., capitalism) is seen as inevitably irrational and destructive. Only one of the “First Hundred” members is a capitalist (and a Christian), and she is described by all of Robinson’s viewpoint characters as stupid, deluded, or corrupt. The only idealists (and thus the only heroes) are Marxists, anarchists, or liberals. It is the tension between the Reds, Greens, and capitalists on Earth that creates the primary conflict of the novel. The political slant is slightly grating, but Robinson does not resort to a lot of overt preaching, as he does in later novels (like Antarctica or Forty Signs of Rain). Readers who agree with his politics will have no problems with this aspect of the book, though they should be cautioned that his depiction of economics is somewhat faulty and hazy. Despite these objections, Robinson’s vision is large and deserves to be taken seriously, seriously enough that other “Martian utopian fiction” might need to be written in answer because he has written an impressively conceived and envisioned future world. It is no mistake that the Mars Society has made its flag red, green, and blue in honor of Robinson’s books. His work is inspiring to would-be Mars settlers. What they will do there and what sort of society they decide to create up there will be a discussion for a future day. Robinson has offered one voice in that discussion. I look forward to reading others.